Ulster Bank All Ireland League Div 2B – Holmpatrick 11/10/2016. The return of Friday Night Lights saw a big crowd in Holmpatrick despite the poor weather conditions. Not for the first time this season, Skerries were forced to make several changes due to injuries and unavailability. In the pack, Joe Glennon returned to the 2nd row, Michael Turvey back in a blind side, while in the backs, Lorcan Jones moved from wing to center and Ruairi Wood making his full debut on the wing. Conditions dictated the play and with Skerries playing with the wind at their back were rewarded two penalties which were duly executed by Paul O’Loughlen, putting 6 points on the score board. Greystones were the heavier pack and took the game upfront to Skerries. Twenty minutes in Greystones Jack Keating scored a try in the corner, conversion was missed. Skerries did put some good phases together but were thwarted by good Greystones defence. Just before the half time whistle went Greystones scored a second try under the posts converted by Kealy to make the score 12-6 to the visitors. The conditions did not improve and on resumption, Greystones scored their 3rd try which was duly converted making the score 19-6 in favour of Greystones. Skerries continued to press for a score. Some good phases and pressures from the Skerries forwards resulted in try scored by Chris Tonge in the corner, the difficult conversion missed. This made the score 19-11 to Greystones and kept Skerries in the game. Changes were enforced by Skerries. Billy Mulcahy replacing Paul O’Loghlen, Kieran Leonard for Evan Skerlock. 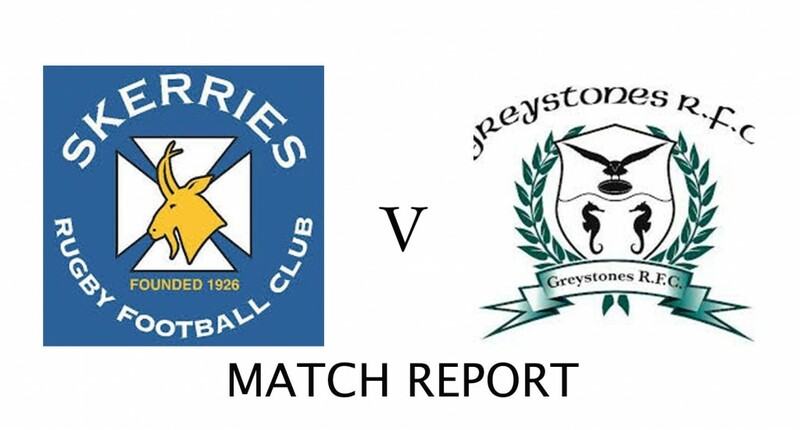 Skerries were forced to defend and with Greystones applying the pressure on the Skerries defence, they scored two more tries and a penalty which saw the game end with a 36-11 victory for the visitors. Skerries played with intent but in the end came up against a good Greystones side who deservedly remain second behind Armagh in the League and will be challenging for promotion come the end of the season. Skerries next AIL match is away to Wanderers on the 26th of November in Merrion Road. Hopefully this rest period will allow some seasoned players to recovery from injury and get Skerries back to winning ways.